The MDDA’s (Media Development and Diversity Agency) National Media Literacy Summit is to be held on the 10/11 April in Gauteng. Felicity is honoured to be chosen to be on a panel discussion with the Department of Education, and representatives from the Free State and the Eastern Cape on the effectiveness of this project. Four provinces have had the experience of this project when learners from schools were introduced to the power of the media, with particular relevance to journalism. In 2011, for the KZN project, Felicity was mandated to introduce journalism to learners from 10 schools in Nongoma and Ulundi. At the Summit held in Ulundi at the Old Legislature Building in April 2011, Felicity gave the young participants a very quick introduction to the right brain by giving them an “unlocking” exercise to do. She also gave them each a book on creative journalism that she had written and a short lesson on what an article is, what news is and where to find it. It was two months later that the actual trainings were held, 5 schools attending the workshop in Nongoma, and 5 schools in Ulundi. In one morning, we showed the teenager journalists, chosen from grades 9 – 11, how to use their right brains to write articles on their particular interests, how to make a mock-up of the newsletter, and then to create their own school newsletter on A3 paper, complete with title, school logo, contents page, editorial team, illustrations and a lead article on the front page. This was an exciting creative workshop with the educator from each school involved with the learners and the newsletters varied from school to school. There were articles on sports, school activities, fashion, problems of teenagers, local community news, interviews, jokes, puzzles, and illustrations. Our particular team wanted to create professional newsletters so we had the handwritten material couriered to us to type and scan and then to have printed. 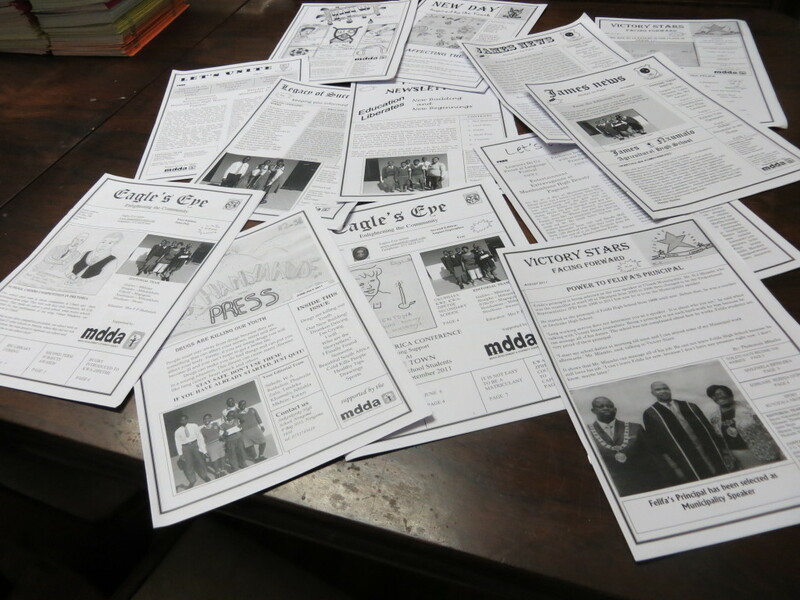 The schools were delighted with these newsletters which would get the learners reading and also update them on school and local activities. The success of this project was made obvious to me when one of the young “journalists” phoned me a couple of weeks ago, to say that he had decided he wanted to be a journalist and needed a further introduction – either to funding to learn, or to go straight onto a news team!